For many people the mere mention of the word ‘ferry’ can create cringe-worthy images of old-fashioned cabins and questionable buffet food. But, boat trips can be an exciting and convenient way to see the world and help you get more intimately acquainted with certain ports – it just depends on the trips you choose. I’ve briefly considered going on a cruise in the past but then just as quickly dismissed the idea because I had no idea of what one would truly be like. Would I get seasick? Would I feel claustrophobic or worse still… would I find it boring? I also need to get the age-factor thing out of the way whilst writing this too. Would it only be the older generation on board, because that’s what people assume right? 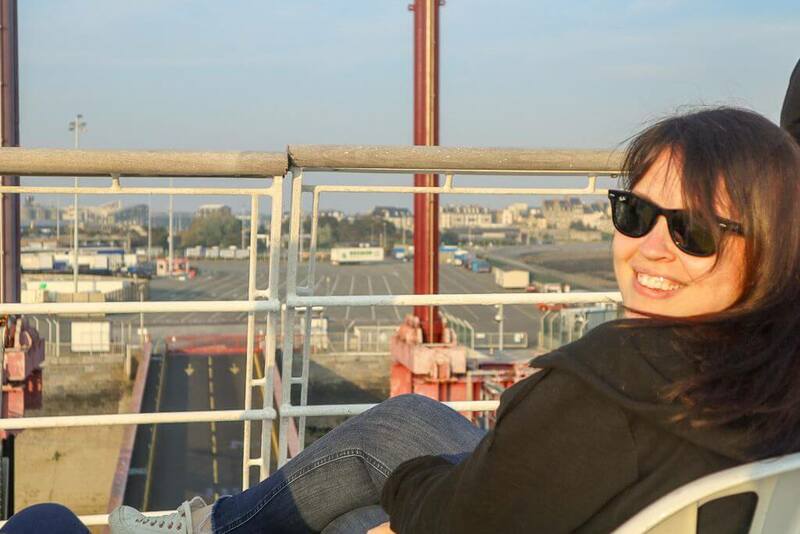 If you saw my recent post on my Day trip to Saint-Malo, then you’ll also have spotted Brittany Ferries invited me on this trip to try the Gourmet Cruise experience. I knew this would be my chance to get a taste for what sailing on board a large ship would be like. Travelling to a different country on a ferry is something that’s brand new to me and being a travel blogger meant it was something I really needed to try. Part of the experience meant that I’d also get to take my car across to France and whilst I’m totally comfortable driving in different countries, taking my own car would also be a new experience. When arriving at Portsmouth it’s very easy to find where you need to go. Aside from the fact there’s a giant ship waiting for you, security and passport control are very distinct, and check-in was surprising quick. With our passports checked and room keys/boarding cards issued, along with a load of other ‘bumph’ you join a queue and make your way on to car-port levels below. Once on board and parked you’re free to roam the boat and enjoy the facilities. No hanging around, no giant queues for security, it was all very easy and very convenient. This journey would take around 12 hours which to me seemed like forever considering the UK and France are not that far away, but when you look at the map the route is a bit further than you think. By the time you’ve factored in two hours of sitting around after airport security, queues at border control and the train from the airport to where ever you really want to be, there’s not that much difference. Our particular ship was the Bretagne. It is named after the French region Brittany, and is decorated in traditional Breton style and colours. Now I’m not going to fib and say it was all fancy and modern, because it isn’t. It is however traditional, very clean and whilst a lick of paint may come in handy in some areas, it really does have everything you need, plus more. Our club cabin room was compact, but still had a little desk with mirror, a TV (both French and English channels), and air-conditioning. The bathroom again was small, but the shower was very strong and hot, and I didn’t mind it at all. Basic toiletries are included along with a kettle, teas, coffee and sugar (something I knew my Mum would like, and who was also with me on this trip). For such a short trip where hardly any time is spent in your room this was fine, but there are upgrade options available and you could also stay in a Commodore cabin which is bigger and has a separate living area too. My son would have called the beds ‘fish-finger’ beds (his nickname for the beds when we once stayed in a caravan in Devon) but again, they were super comfy, the pillows were fluffy, and the sheets were soft. I slept extremely well on both nights we were on-board. Gathering our bearings, we went for a little wander to see what we could find. Our rooms were on the 8th deck, there’s nine altogether, so after a quick peek at the views from the helicopter pad on top we worked our way down with the eventual plan to find ourselves at the restaurant just in time to enjoy our three-course gourmet dinner. The seventh floor had more cabins but also a huge gift shop, where you could buy all your duty-free items. An entertainment bar and lots of seating areas with charging points to sit and chill at. There’s windows and port-holes all around too so you can always see the sea. We found a games room, a cinema, another cafe/bar area and a piano bar which seemed a little bit more for the type of people that weren’t too keen on the singer in the main bar area (that was us). Sorry Brittany Ferries, but the entertainment was really cringe! Admittedly we’re the worst to please in this regard, but I don’t think anyone was enjoying it and whilst the poor girl singing was very lovely, it was very ‘cabaret’ and very ear-piercing… but if that’s your thing, then maybe you’d like it! Otherwise, the guy playing the piano in the other bar was much much better. Either way, the entertainment on-board wasn’t what we were there for, and not a big-deal for us. Plus, this is quite a subjective matter. Anyhow… let’s get on to the important stuff. Aside from the odd swaying feeling, the restaurant on board is exactly like a normal restaurant and at some points you completely forget you’re at sea. Neatly laid tables with crisp white tablecloths and napkins, cutlery and lovely French waiters who like to keep pouring you more wine. SOLD! We helped ourselves to the buffet for our starters, all very happy at this point, and the food is on a whole different level to what I’d expected. Delicious and fresh, my only slight quibble was that nothing is labelled so if you’re vegetarian (like me) it’s difficult to tell if some of the options had meat in. The waiters helped me out though, so it was all fine and dandy. And My Mum had the Dish of the day which was quail and she also said it was delicious. And for dessert, well, for dessert I’m afraid to say my greedy inner dessert monster came out and I tried them all!!! Well, I do bake cakes for a living, so I call it a case of ‘occupational hazard’ really. And plus, it would have been rude not to try them all. Hint: the pistachio cake and the Crème brûlée were out of this world… you may want to have more than one slice. We were all so stuffed that after gorging on cheese and having a few more drinks we called it a night and headed to our rooms ready for our 7.15am wake-up call and arrival in St Malo. Back to the morning alarm, (which was a very strange kind of highland, folklore kind of tune). It doesn’t just at once blare out loud, it starts gradually and stops after a few minutes. All perfectly civil and gives you time to get ready and go enjoy a few croissants and some coffee before you disembark and explore for the day. And that’s exactly what we did… go read what we got up throughout the day right here. It was lots of fun from the moment the anchor dropped. We had so much fun it almost made me not want to re-board the boat. But the sunset from the top deck was reeling me in and the idea of finding a cosy chair, buying a nice cool beer and chilling out on top-deck was far too appealing. So, we headed back in the car, repeated the very smooth, organised check-in procedure and made our way back on board. One thing that surprised me was you’re given completely different rooms and I’m pretty sure the boat didn’t leave the dock all day, so I’m not sure on the reason for this. But it was no bother, and we found our new rooms as easily as we did before. A smidgen sun-burned, a lot tired, but all happy with what we’d done in the last 24 hours. All in complete agreement that we’d 100% do this again, I’m now not so averse to going on a much longer cruise either. What do you think? Have you sailed with Brittany Ferries before? Did you sleep on board? Would you go again? I hope so… I have a feeling exploratory cruises are going to become a bit of a trend soon and the results are a truly transformed travel experience. Go check out the routes available right here, or if you like the idea of the Gourmet Cruise to St Malo, which is what we did, including lunch at a fab French restaurant in the day too, you can find those exact details right here. "(AD) A Day in Saint Malo, France"
"23 Random Facts About Iceland"